What Buffer Triggers and Actions are Supported? New Profile - Triggers when a new profile is added. Add to Buffer - Add an item to your Buffer or send an update immediately to any of your Buffer profiles. Add to Schedule - Add an item to your Buffer, scheduled at a specific time in the future. Getting started with Buffer is really fast and easy. 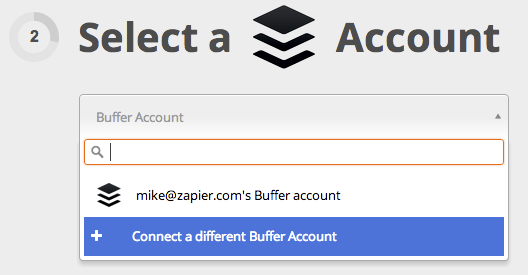 When connecting a new Buffer Account to Zapier, here is what to expect. You're given the chance to name this Buffer Account which is really handy if you have more than one Buffer Account inside Zapier. Of course you can just leave the default, if you'd like. 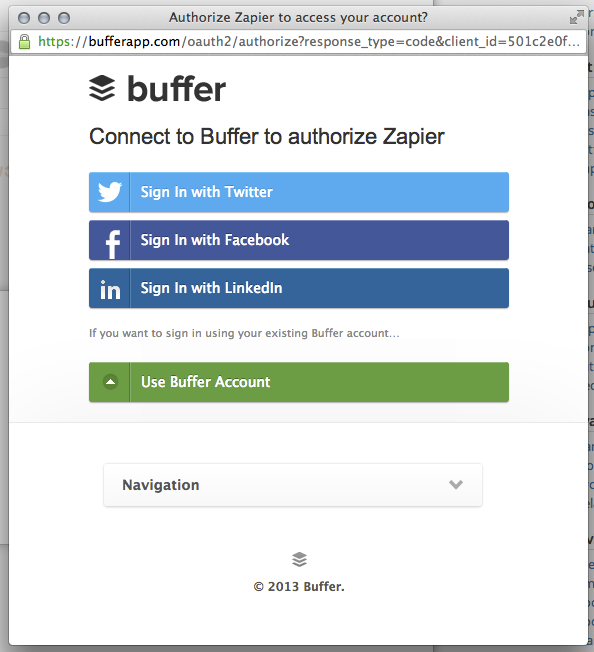 This screen is what allows Zapier to access and create data in your Buffer account, for you. To finish, click "Allow". You're done! 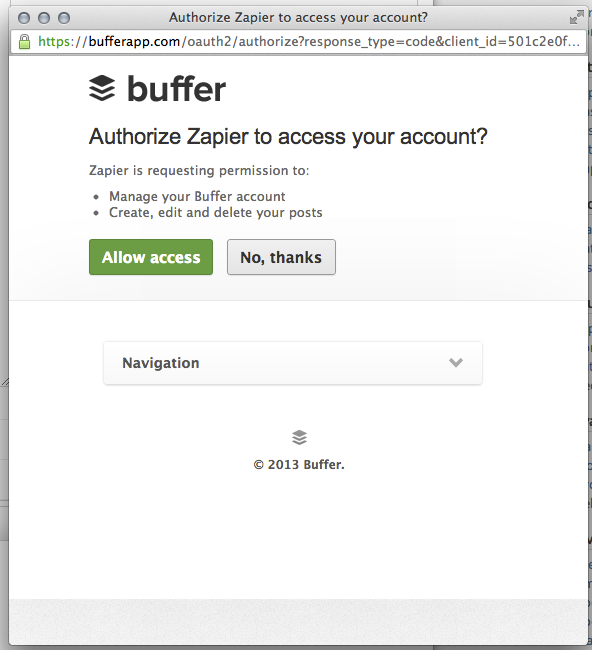 You've successfully connected Buffer to Zapier and you can continue setting up your Zap. This is a message from Buffer. The free Buffer plan allows 10 items in the queue. If you want to put more than 10 items in, you'll need to upgrade your Buffer plan to their "Awesome Plan". Be aware that Zapier does not by default parse, limit, shorten, or strip characters before sending your message to Buffer. In many scenarios this leads to undesirable effects. If you need to reformat the data from the trigger, you can do so with a multi-step zap using our Formatter app. This will allow you to strip out HTML and line breaks, or other undesirable characters. You can also truncate posts to be a certain length. Even though the Photo URL field is optional in the action, for certain profiles, like Instagram, it is required. Make sure to map the image you want to post to Instagram in that field.